This paper develops a link-based full cost model, which identifies the key cost components of travel, including both internal and external versions of cost, and gives a link-based cost estimate. The key cost components for travelers are categorized as time cost, emission cost, crash cost, user monetary cost, and infrastructure cost. 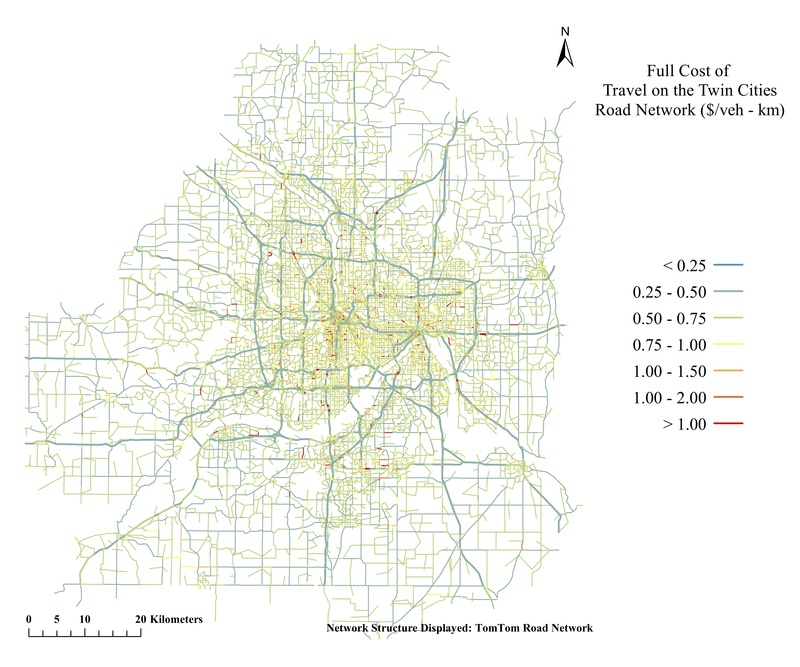 Selecting the Minneapolis – St. Paul (Twin Cities) Metropolitan region as the study area, the estimates show that the average full cost of travel is $0.68/veh-km, in which the time and user monetary costs account for approximately 85% of the total. Except for the infrastructure cost, highways are more cost-effective than other surface roadways considering all the other cost components, as well as the internal and full costs.